The cheese grits/polenta is an easy dish to make especially with a cold water start. The combination of the tangy, bourbon-based barbecue sauce with the creamy polenta/cheese is a meal that is worthy for company but quick and easy for a week night. 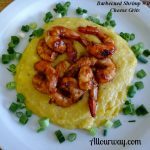 In a medium saucepan mix the cold chicken broth, minced garlic and grits or polenta and over moderate heat, bring to a low boil, stirring frequently, until the grits are tender, 20 minutes. ( It will take longer with the polenta). Remove the saucepan from the heat and stir in the cheese, olive oil, butter and cream. Season with salt and pepper and serve immediately with the barbecued shrimp and sprinkle the green onion around the dish. If using polenta, it will take a little longer to finish.